I'm sad to report that I found an injured Great Egret in the Central Park "Pool" yesterday. [4/5/13] The Pool is the pond located on the western edge of the park roughly between 100th and 103rd street. It appears to have sustained a serious injury to the base of it's left leg though I could not determine the precise location or extent of the wound. When it flew, it's left leg hung limply. I must have come upon it not long after the precipitating event as there was much blood both on the bird and the rock that it was perched on. I asked a few bystanders, including a person photographing a young Red-tail in a nearby tree, but nobody saw anything. As it was too late for me to contact the Urban Park Rangers, I called the Wild Bird Fund, a wild bird rehabilitation center on the upper west side of Manhattan. I left a message. The short of it is that they don't capture the birds themselves. The injured animal must be dropped off at the center which they will then tend to- space providing. I checked the Pool at 7 this morning and to my surprise, the egret was there and still alive. As soon as I learned that the W.B.F. would not be able to capture the bird, I got in touch with an Urban Park Ranger who said they would pass on the information to the appropriate people. That was at noon. I re-found the egret on the dike at the north end of the Reservoir as I made a stop on my way home at about 6:15 this evening. I could see that the area around the leg base was raw and pink though it looked like the bleeding had stopped. I would have tried t for the bird myself however I recently sustained an injury of my own leaving me considerably less agile at the moment. I was also concerned about the tenuous condition of the egrets left leg/tarsus and felt unqualified to conceive of a plan to subdue it with out causing the poor soul further injury and suffering. 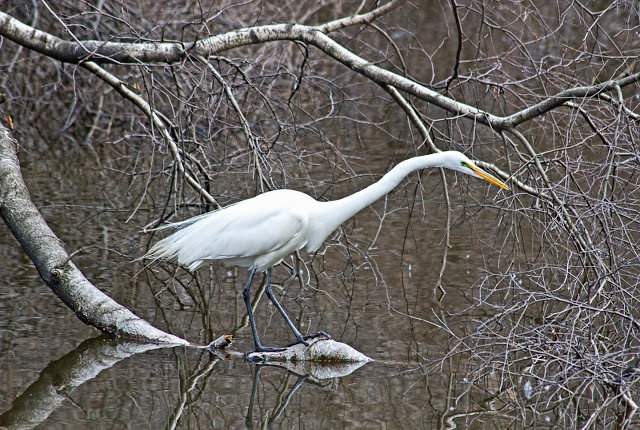 This is probably the same Great Egret that Tom Fiore mentioned in his post as there have been no others in the North End since it's arrival a week or so ago. It is a beautiful breeding plumaged individual with bright green lores. Hopefully this post will get through to someone able to help. Contact me directly for further information and or if I can be of further assistance. On a lighter note; there was also a Great Blue Heron standing on the dike in the middle of the Reservoir and a small flock of north bound Double-creasted Cormorants flying high above. Also, Eastern Towhee( likely an over wintering bird), Brown Thrasher( Also), Swamp Sparrow and Winter Wren in the Loch.